Let's be honest: Hunting is not mainstream. I know it sounds blasphemous to say, but in modern society, hunting has sort of fallen by the wayside in favor of living indoors and typing "YOLO" on Facebook whenever you do something totally crazy. Today, hunting has a lot of opponents. My colleagues and I have made no secret about our disdain for Ingrid Newkirk and her band of attention whores. Similar organizations threaten the very way of life for hunters by means of sabotaging hunts, or by lobbying for ammo bans without concrete scientific data. Despite all this, the real opposition for hunters in the northeast doesn't come bearing signs screaming "Meat is murder!" Rather, hunters needn't look any further than their own peers to see who's really stepping on their rights. The Sunday hunting debate is one that has raged on for years. With origins in Puritanical blue laws, legislation barring hunting on Sunday keeps hunters from enjoying their lifestyle while still fitting in time for work and family during the rest of the week. Under the guise of keeping the Sabbath holy -- which is all fine and good, if you choose to follow that religion -- states have been able to keep a number of trades besides hunting from going down on Sunday. Cars, alcohol and even housewares have been prohibited under blue laws -- some to this day. Today, there are 11 states that prohibit or restrict hunting to some extent. While most have exceptions to the rule, two states -- Maine and Massachusetts -- ban Sunday hunting altogether. Perhaps unsurprisingly, there are some who wish to keep it this way, but the shocking part is just who is trying to keep hunters out of the woods on Sunday. Pennsylvania lawmakers are no strangers to the hunting debate. For the last few years, the state's Sunday hunting ban has been on the chopping block, yet the push from hunters was receiving pushback from other hunters. In a July 3, 2011, story published in The (Easton, Pa.) Express-Times, state Rep. Joe Emrick, R-Northampton, who is a member of the House Game and Fisheries Committee, recognized the opposition coming from a surprising source. "It's a very polarizing issue," he said. "And the feedback that I'm getting from most hunters and hunters in my district is that they are opposed to it, surprisingly." In the same story, state Rep. Marcia Hahn, R-Northampton, said the hunters in her district tend to side with farmers. "I did speak to a lot (of hunters) in my district," Hahn said. "They are against it because of the farmers in that area are against Sunday hunting." Now, the battle for Sunday hunting will move on to the Pennsylvania Supreme Court, with grassroots organizations on the front lines hoping to overturn the state law. "Lawmakers had 25-plus years to act on this and they did not, so we're going to take it out of their hands and go straight to the courts," said Kathy Davis, a volunteer for Hunters United for Sunday Hunting. Pennsylvania isn't the only state where Sunday hunting is (hopefully) on its way out. In Connecticut, the state legislature recently repealed the state's Sunday alcohol prohibition -- yet Sunday hunting is still illegal. Same goes in Virginia, where proposed legislation to repeal Sunday hunting bans have been tabled for the remainder of the year. But why the opposition? A report published by the National Shooting Sports Foundation claims up to 27,400 jobs could be created by lifting bans and restrictions in all 11 states, potentially paying $734,187,827 in wages and bringing in about $2,216,691,102 in economic activity. Hard to argue with those kinds of numbers, but amazingly, some still have a problem with it, and the vocal minority continues to get its way. Beyond economic growth, Sunday bans and restrictions really hamper hunters' time to get out in the field -- which in turn cuts back on recruitment. 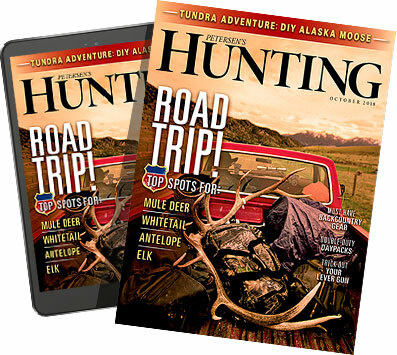 "While I can't overlook the ironic, unconstitutional nature of Sunday hunting laws, there is really a bigger, more unfortunate issue at stake," said Mike Schoby, editor of Petersen's Hunting. "In today's uber-hectic world, the two-day weekend is one of the few brief moments families get to spend together. With soccer, tee-ball and other sports usually taking up most Saturdays, this leaves only Sunday for parents to take children hunting. "Remove that day and what happens? Reduced recruitment, reduced participation and a future generation that doesn't know anything about hunting other than a vague recollection that father 'used to do it.' If you want to get more kids afield to continue our great heritage, removing obstacles like Sunday hunting laws is mandatory." Yet the vocal minority continues to get its way. Though the bans remain in place for now, the fight is growing stronger than it has ever been. It may not be long until states finally repeal Sunday hunting bans and restrictions. Until then, we'll just have to keep fighting the good fight, and make the most of Saturday. This map, provided by the Coalition to Lift State Bans on Sunday Hunting, shows states with restrictions or bans on Sunday hunting. For more information on individual state statutes, click here. And be sure to make your voice heard; visit our friends at Sportsmen Vote and take their poll.